If you want to send a note anonymously to someone or to a group of note recipients read this article. By default ShixxNOTE is working like this, for example imagine local network with many computers in it. Your computer name is "STEVEN-PC" and you want to send note to computer "PETER-PC". 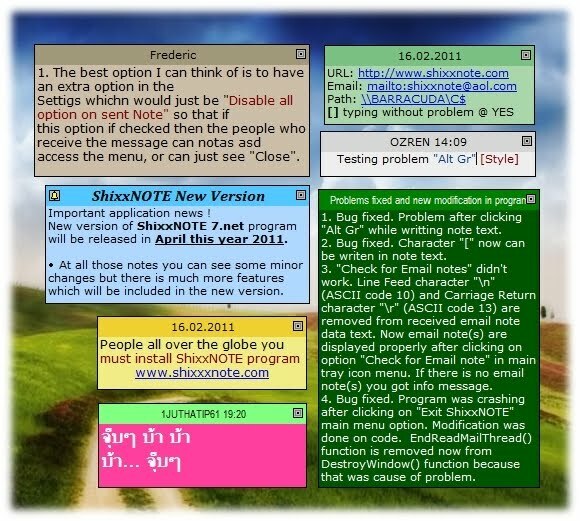 You will write some text on note and with ShixxNOTE option "Send note to" - "Other" you will add "PETER-PC" in your recipients list and you will click send button. User of the computer "PETER-PC" is some guy Peter. Then Peter will receive note and he will see that received note is from computer "STEVEN-PC", also on a note title there will be time stamp and immediately he will have new note menu option "Reply to STEVEN-PC". But lets say that Steven user of the "STEVEN-PC" computer doesn't want anybody to know that he is a sender. Steven for some reason wants to send anonymous note to few of his co-workers. To send anonymous note you can do it always when you are in "Send note to" - "Other" dialog where you can change "Sent from:" drop down list and select "Anonymous" so nobody can not trace to you. But now I will show you how you can set in ShixxNOTE program "Anonymous" as a default setting. Right mouse click on a ShixxNOTE tray icon which is located at your taskbar to get program main menu. From main menu select "Settings" and then go to "Network settings" tab. There you find drop down list "Default sent from:" where default is "Computer name". That is a program default setting so if you are sending note to other they will see your computer name in menu item "Repy to COMPNAME". But if you select "Anonymous" in that list then yours recipients will receive exactly the same note as you have on your screen, with the same text in the note title. Which is different because normally text in title show you time when note has arrived and also note font is set to Arial Narrow. So simply select "Anonymous" in the list and click on a "Save and apply changes". From now on notes sent from your computer will not have time stamp, Arial Narrow font and note will be without "Reply to ..." note menu item. P.S. As you have noticed you can select also your "IP Address", "E-Mail" or "Name" when you can put any name which will be then showed to recipient.